"Stop." said Odd. The waterfall was one of his favorite places in the world. From spring until midwinter it ran high and fast before it crashed down almost a hundred feet into the valley beneath, where it had carved out a rocky basin. In high summer, when the sun barely set, the villagers would come out to the waterfall and splash around in the basin pool, letting the water tumble onto their heads. Now, the waterfall was frozen and ice ran from the crags down to the basin in twisted ropes and great clear circles. "It's a waterfall," said Odd. "I used to come out here. And when the water came down and the sun was shining brightly, you could see a rainbow, like a huge circle, all around the waterfall." "No water," said the fox, "no waterfall." "There's water," said Odd. "But it's ice." There was a crack, and an icicle as large as Odd smashed down to the surface of the frozen pool. "Clever," said the bear, in the kind of tone of voice that meant it wasn't clever at all. "You broke it." "Yes," said Odd. He inspected the shards of ice on the ground, picked up the biggest, most cleanly broken piece he could find, then took it to the side of the frozen pool, and put it on a rock, and stared at it. "It's a lump of ice," said the fox. "If you ask me." "Yes," said Odd. "I think the rainbows are imprisoned in the ice when the water freezes....like fish in a shallow pool. 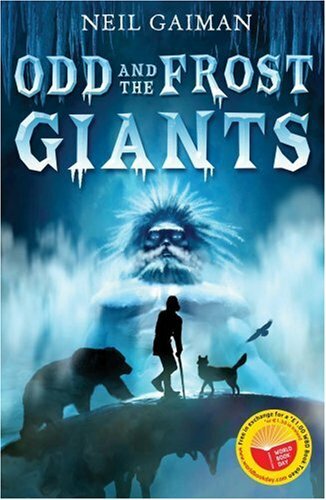 And the sunlight shall set them free...."
Make sure to check out my review of Odd and the Frost Giants tomorrow, as part of the Winter Wonderland line-up!